Examining the cult popularity of suicide websites in contemporary Japanese culture, the play looks at a decade where conflicts with other nations are sensationally streamed on 24 hour rolling news channels and terrorist organisations boast about their achievements on YouTube. Even chronic depression is catered for by the increase of ‘informative’ suicide websites. Are people becoming more jaded with their real existence? Has life lost sanctity and meaning? This is the first time that this Japanese play will be performed in English so is a great opportunity to see the darker side of Japanese theatre. 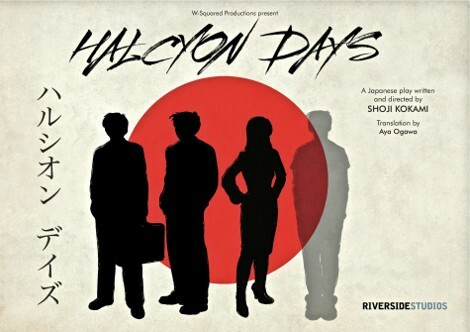 This competition is for a chance to win a pair of tickets to see Halcyon Days at the Riverside Studios in Hammersmith. You can choose any date that the production is running for between 23rd August and 18th September 2011 depending on seat availability. Please contact us if you are the winner of the competition and let us know your preferred date so we can confirm tickets for you. As always, we will be running this competition through facebook, so head over to our facebook page and leave a comment on the competition post. You can also enter the competition by following our Japan Centre twitter feed and re-tweeting the competition post! We will choose a random winner on Friday 12th August and let you know over the weekend if you have been chosen. Good luck everyone and keep an eye out for great new Japan Centre competitions every week! Posted in Food and tagged competition, theatre. Bookmark the permalink.